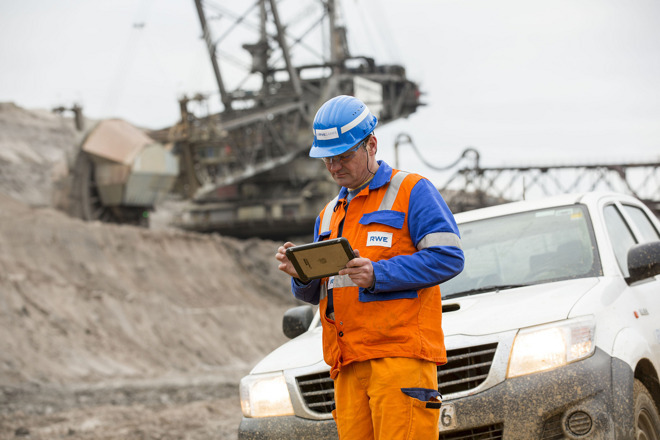 Field workers at RWE's Hambach mine started using iPad minis in December, Andreas Lamken told Bloomberg. The company has so far distributed a "couple hundred" iPads, he said, and in the next several months will deploy more at two other mines, followed by utility workers. The use of iPads is intended as a cost-cutting measure, as the German electricity market is proving tough for RWE. Prices are at their lowest point since 2002, and the country's shift to renewable energy is impacting profits on "dirtier" power sources like coal, gas, or nuclear. Lamken noted that in the short term, the Minis in use at Hambach are saving about 30 minutes a day in paperwork. In the long run, RWE is hoping to make repairs "predictive," and shorten commute times by dispatching workers based on their current location. The Hambach mine alone measures over 11 square miles, making it easy to waste time by dispatching someone on the opposite end of the site. RWE is the first energy and utility client for MobileFirst, which was launched in 2014. Apple and IBM are offering over 100 iOS apps tailored to different business demands. Hardware, software, deployment, and support duties are split according to the companies' specialties.